Banning plastic in a bid to cut pollution and tackle climate change could cause environmental damage, a team of academics have claimed. Green campaigners have called for reductions in plastic manufacturing or outright bans in some areas. However, the academics from Heriot-Watt University said replacing plastics with other packaging such as glass or metal could double global energy consumption. They also warned it could lead to a tripling of greenhouse gas emissions. Professor David Bucknall, from the university's Institute of Chemical Sciences, told the BBC's Good Morning Scotland programme: "There have been studies in the last couple of years that have demonstrated that if you take out all of the plastics and replace them with something else...then that would actually make an increase in greenhouse emissions. "I'm not saying that plastics are not greenhouse emissive, but the replacements would be vastly worse than the plastics themselves. "This is the challenge that we face going forwards. 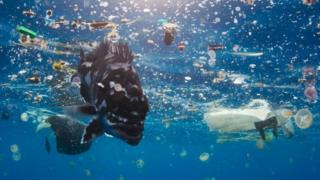 Obviously we want to remove the plastics from the oceans, but what do you replace the plastics that we rely on now with?" The world is consumed with plastic and the politicians are consumed with doing something about it. For very creditable reasons, they've been clamouring to ban products which cause the most harm to the marine ecosystems. Microbeads were first, followed by cotton buds. Straws are in the firing line too and no one really knows how to deal with coffee cups. But these academics are warning of the inadvertent consequences. Transporting glass, for example, uses much more fuel simply because it's heavier. They're not saying we should forget the war on plastic, but simply to take a holistic look at the issue. The risk is that these mixed messages confuse the consumer. The issue has gained momentum and led to significant behavioural change. All agree that simply reducing our plastic use, rather than replacing it with something else, is probably the best thing we can do. Prof Bucknall also warned of the potential economic damage caused by a total ban. He said: "Plastics are a vital component to the British economy - I think it contributes something like 7% of the gross product. So, economically, there would be a big impact. "Furthermore, because plastics are lightweight, transportation of consumer goods in plastic packaging means fewer vehicles are required for transportation of those goods, therefore burning less fuel and greatly reducing greenhouse gas emissions. "So whilst some people may wish for plastics to be reduced or banned altogether, we need to ensure we are replacing them with materials that are better for the planet. "In many cases there is no credible alternative to using a plastic so we need to move towards a 'circular economy' for plastics, rather than the largely 'make-use-dispose' model we currently adopt."